An analysis by MIT and University of Chicago researchers concludes that market forces alone won’t reduce the world’s reliance on fossil fuels for energy. Historical data suggest that as demand grows, new technologies will enable producers to tap into deposits that were previously inaccessible or uneconomic. And the recovered fuels will likely be our cheapest energy option. Without dramatic breakthroughs, widespread power generation from solar photovoltaics and wind will remain more expensive than using fossil fuels. And electric vehicles won’t replace gasoline-powered vehicles unless battery costs drop and/or oil prices go up at unrealistic rates. The researchers conclude that if the world is to cut greenhouse gas emissions enough to avert a disastrous temperature rise, policymakers must put a price on carbon emissions and invest heavily in research and development to improve low-carbon energy technologies. Experts agree that significant climate change is unavoidable unless we drastically cut greenhouse gas emissions by moving away from fossil fuels as an energy source. Some observers are optimistic that such a shift is coming. Prices of solar and wind power have been dropping, so those carbon-free renewable resources are becoming more cost-competitive. And fossil resources are by their nature limited, so readily accessible deposits could start to run out, causing costs to rise. A study from MIT and the University of Chicago has produced results that crush the optimistic view that market forces alone will drive the transition. The analysis shows that while innovation in low-carbon energy is striking, technological advances are constantly bringing down the cost of recovering fossil fuels, so the world will continue to use them—potentially with dire climate consequences. 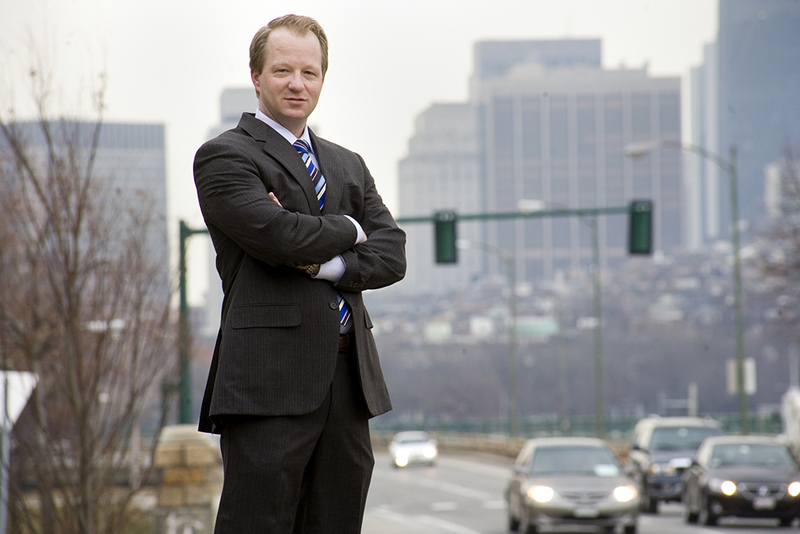 “If we want to leave those resources in the ground, we need to put a price on carbon emissions, and we need to invest in R&D to make clean energy technologies more affordable,” says Christopher Knittel, the George P. Shultz Professor at the MIT Sloan School of Management. One source of insight into future supply is historical data on fossil fuel reserves—deposits that are known and economically viable. Using the BP Statistical Review of World Energy, the researchers compiled data on annual reserves of oil, natural gas, and coal back to 1950. The figure below shows those estimates for the past 34 years. According to the data, reserves of coal declined over time and then rebounded about a decade ago at a level sufficient to meet world demand for the next 100 years. In contrast, oil and natural gas reserves have marched steadily upward at a rate of about 2.7% per year—despite their continual withdrawal and use. Indeed, at any point in the past three decades, the world has had 50 years of both oil and gas reserves in the ground. Data from the BP Statistical Review of World Energy, 2015 show proven reserves (economically recoverable deposits) for the past 34 years. 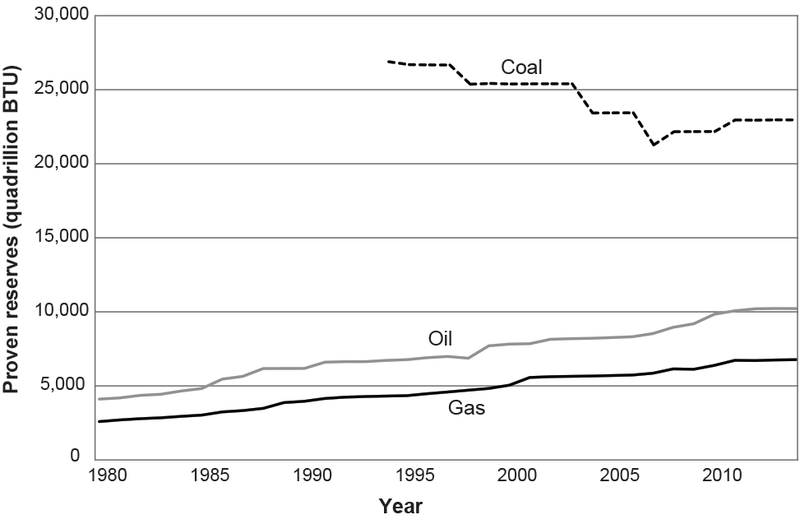 Coal reserves were in decline but leveled off in the past few years. Oil and gas reserves have steadily increased at an annual rate of about 2.7%. As oil and gas reserves are depleted, technological advances constantly make new deposits economically accessible and extractable. Two examples illustrate how technological progress affects the level of oil and gas reserves. Both shale and bituminous sands (tar sands) were long recognized as possible sources of hydrocarbons. But the low permeability of shale made removing oil and gas difficult, and tar sands contain a mixture of heavy oil, sand, and clay that’s viscous and hard to handle. In both cases, technology has made hydrocarbon recovery economically feasible. Hydraulic fracturing (fracking) and horizontal drilling enabled US operators to begin tapping oil and gas from low-permeability rock formations. As a result, US oil and gas reserves expanded 59% and 94%, respectively, between 2000 and 2014. And in Canada, advanced techniques have enabled companies to extract the heavy oil mixtures from tar sands and upgrade them to light, sweet crude oil. Taken together, those two “unconventional” sources of hydrocarbons now make up about 10% of oil and gas reserves worldwide. Another question is whether companies are becoming less successful at locating and recovering oil and gas as more reserves are withdrawn. Historical data show the opposite. 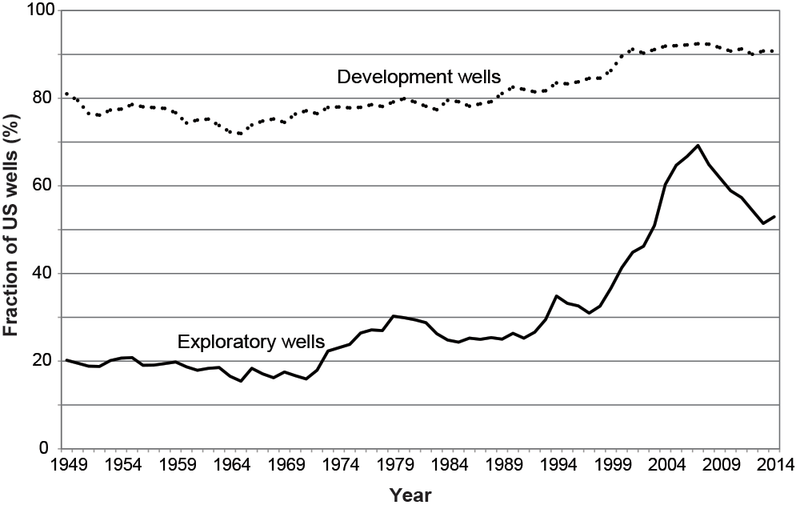 The figure below plots the fraction of successful exploration and development wells in each year from 1949 to 2014. The probability of a successful exploratory well has drifted downward at various periods, but it’s still markedly higher than it was in much of the past. Development wells are drilled into formations known to contain oil or gas, but they still can run into technical difficulties and ultimately produce no output. Nevertheless, the fraction of successful development wells has also largely grown over time—an important indicator as 10 to 20 times more development than exploratory wells are now typically drilled. Data from the US Energy Information Administration and IHS on drilling outcomes show that companies have for the most part become increasingly successful at finding new oil and gas deposits in their exploratory wells and at recovering those deposits in their development wells. Again, advances in technology help firms sustain production despite the constant withdrawal of resources. The fact that we always seem to have 50 years of both oil and natural gas is striking to Knittel. “It suggests that there’s equilibrium between technology and demand,” he says. “If demand goes up rapidly, then technological progress or R&D also goes up rapidly and counterbalances that.” Because there’s so much coal, there’s no real need for technological progress in locating or recovering it. “But our guess is that if it ever started to get in somewhat short supply, we would also invest in R&D on the coal side,” notes Knittel. A last consideration on the supply side is the availability of fossil fuel resources—deposits that are known to exist but are not currently economical to extract. While estimates of resources range widely, they’re far larger than current reserves in every case: as much as four times larger for oil, 50 times larger for natural gas, and 20 times larger for coal. If technological progress continues, those resources could move into the category of economically recoverable reserves, extending the years of available oil, gas, and coal “for quite some time,” says Knittel. Two resources are known to exist in large quantities. One is oil shale, a fine-grained sedimentary rock that contains oil and gas. If oil shale became economical in the near future, it would nearly triple oil reserves. The other resource is methane hydrates, which are solid mixtures of natural gas and water that form beneath sea floors. Methane hydrates are evenly dispersed across the globe, and there’s a big incentive to extract those resources in regions where natural gas is expensive. “Given the industry’s remarkably successful history of innovation, it seems more than possible that oil shale and methane hydrates will become commercially developed,” says Knittel. He finds the prospect worrying. Refining oil shale would involve far higher carbon emissions than processing conventional oil does, and tapping methane hydrates would require disturbing the ocean floor and also carefully containing the recovered gas, as the climate-warming potential of methane is far higher than that of carbon dioxide. Not surprisingly, as fossil fuel supplies have been increasing, global consumption of them has also grown. Between 2005 and 2014, consumption of oil rose by 7.5%, coal by 24%, and natural gas by 20%. But in the demand arena, the future may not look like the past. New technologies are evolving that could shift demand away from fossil fuels. To investigate that possibility, the researchers examined carbon-free options in two major fossil fuel–consuming sectors: power generation and transportation. One carbon-free option for generating power is nuclear fission, but over the past decade fission has become less cost-competitive, and plant construction has slowed. The researchers therefore focused on two rapidly growing options: solar photovoltaics and wind turbines. To compare costs, they used the levelized cost of energy (LCOE), that is, the average cost of generating a kilowatt of electricity, accounting for both upfront costs and operating costs over the lifetime of the installation. Data from the US Energy Information Administration show that the LCOE of solar has fallen dramatically over time. However, on average, electricity from a solar array in the United States is still about twice as expensive as electricity from a power plant fired by natural gas—and that’s not accounting for the cost of backup natural gas generation, batteries, or other storage systems needed with intermittent sources such as solar and wind. The LCOE for wind looks more promising. Wind is cheaper than both nuclear and coal. But again, wind is intermittent and location-dependent, so a meaningful comparison would need to include buying an electricity storage system and perhaps beefing up transmission. Turning to the transportation sector, the researchers focused on the much-touted electric vehicle (EV) and its potential for taking market share from the petroleum-burning internal combustion engine (ICE) vehicle. Under what conditions will consumers spend less if they buy and operate an EV rather than an ICE vehicle? To find out, the researchers developed a simple spreadsheet that calculates the lifetime cost in 2020 of owning each type of vehicle, including upfront costs and gasoline costs. (Download the interactive spreadsheet.) 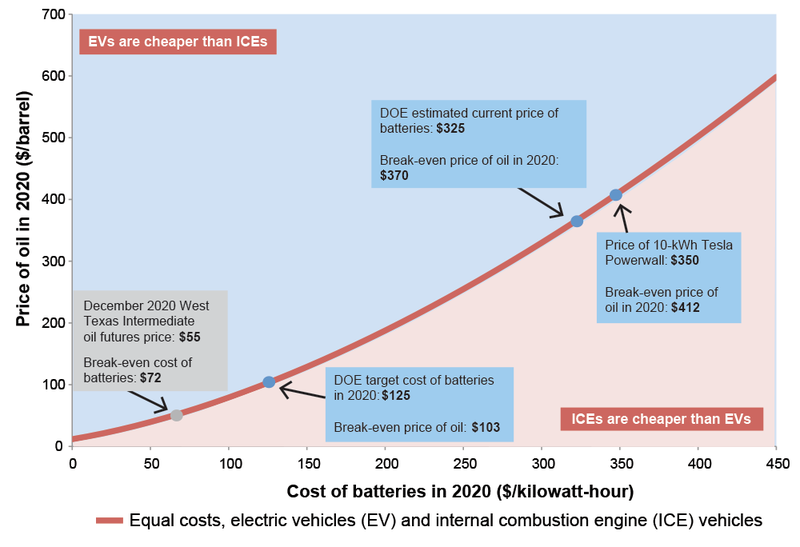 The results of their analysis—presented in the following figure—show that even under optimistic targets for the price of batteries, an EV is unlikely to compete with an ICE vehicle. For example, the Department of Energy (DOE) estimates current battery costs at $325 per kilowatt-hour (kWh). At that cost, an EV is less expensive to own only if the price of oil exceeds $370 per barrel—and oil is now at just $50 per barrel. The DOE’s target for battery cost in 2020 (only four years from now) is $125. At that cost, oil has to be $103 per barrel for cost-conscious consumers to choose an EV. Knittel points out two other considerations. Their analysis assumes an EV with a range of 250 miles. Expanding that range requires adding more batteries, so batteries will have to be even cheaper for the EV to be cost-competitive. In addition, when looking to the future, it’s important to remember not to compare future costs of an EV with current costs of an ICE vehicle. Historical evidence suggests that ICE fuel economy improves by about 2% per year, so operating costs will continue to decline in the future—an effect included in their analysis. To underscore the immense amount of fossil fuels in the ground and the importance of leaving them there, the researchers performed one more calculation. Using a climate model, they calculated the change in global average temperatures that would result if we burned all the fossil fuels now known to exist. The result is a temperature increase of 10°F to 15°F by 2100—a change that would alter the planet in hard-to-imagine ways and dramatically threaten human well-being in many parts of the world. T. Covert, M. Greenstone, and C.R. Knittel. “Will we ever stop using fossil fuels?” Journal of Economic Perspectives, vol. 30, no. 1, winter 2016, pp. 117–138.